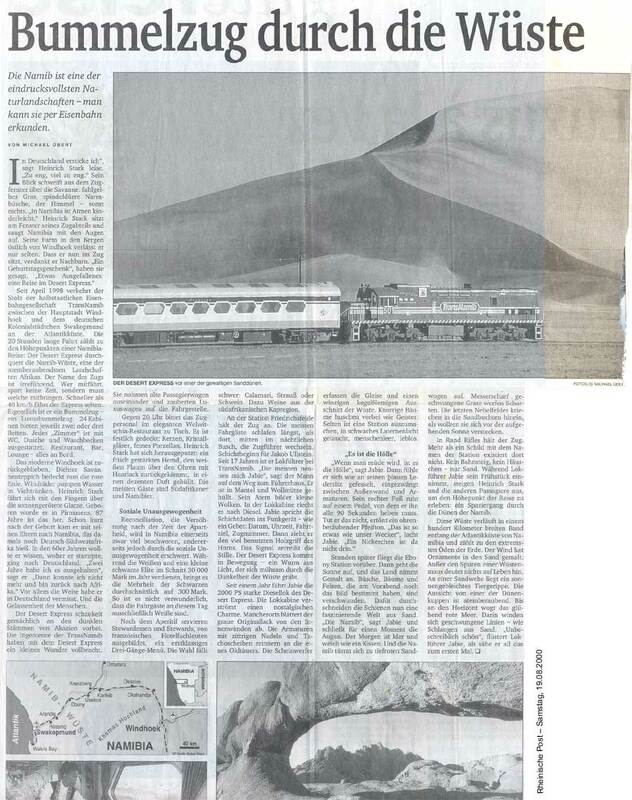 August 2000: I found an interesting full-page article about the "Desert Express" in my local newspaper Rheinischen Post. My eyes were stuck on the black/white picture of the engine. The engine looks great, what about a model in LEGO bricks? 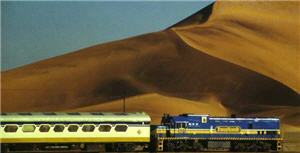 I started to email with Namibia and got back some nice coloured pictures form the train. Blue - White - Yellow. Standard LEGO colours! 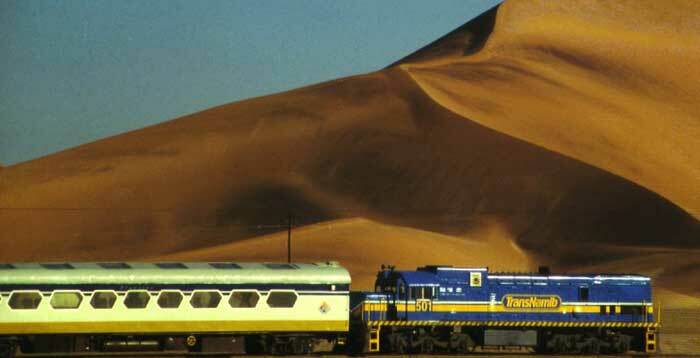 Transnamib, the Namibian Railway company also gave me the adress of the German photographer Michael Obert. 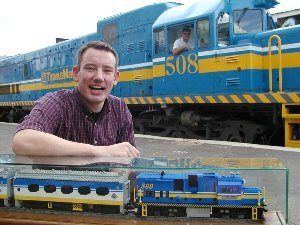 He sold me some more pictures of the train. Even if Anita from Transnamib has never seen a picture of the model she was joking and said, I should bring a copy of the train down to Namibia. November 2000: I brought back my childhood LEGO bricks from "dark-ages" – so let's begin to build the train. 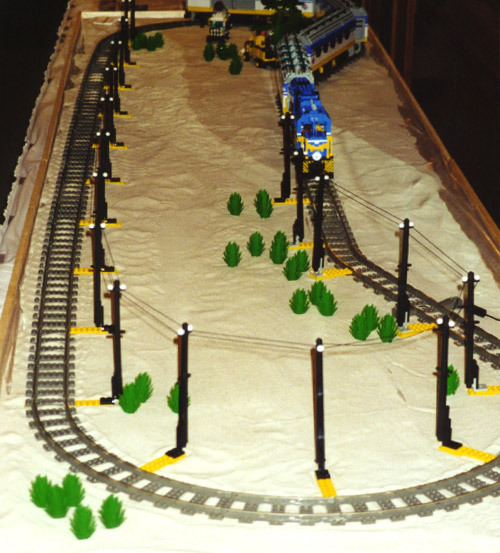 December 2000: The LEGO Desert Express is finished. 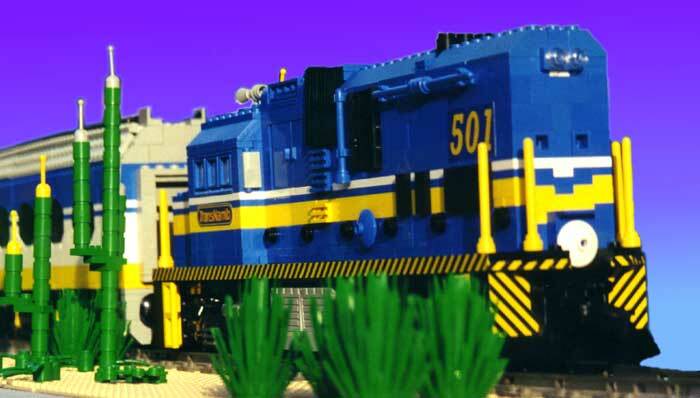 Here you can find the first postings at the German 1000steine forum and at lugnet.trains. Transnamib repeats their offer after they saw pictures of the model on the internet. 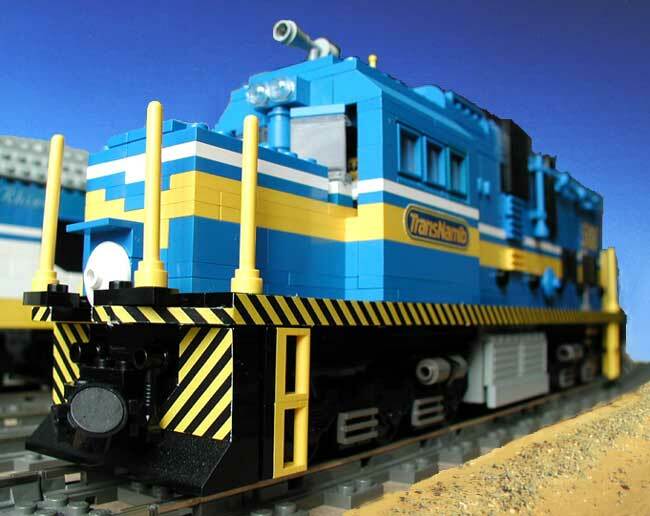 8-wide – this is the width of the LEGO Desert Express. Waggons and the engine are each 46 studs long. The train consists of a diesel engine and four coaches named "Welwitschia", "Spitzkoppe", "Oryx" and "Rhino". The real Desert Express got 9 coaches all together including 24 air-conditioned bedrooms, bar and restaurant. December 2001: My trip to Namibia is getting closer. Flight tickets are booked, accommodation is organised and the train tickets are booked … all by Transnamib! Februar 2001: I met Anita Witt in person in Düsseldorf. I was able to present the LEGO model at a meeting of several travel agents. Therefore I brought 25 kg of sand to the hotel's conference room. The offer to come to Namibia is repeated and we plan for next May. Meanwhile I collected more then 3500 elements for the second Desert Express which should go to Namibia. 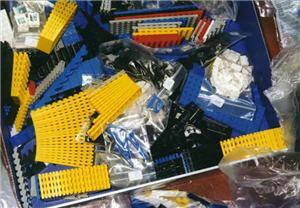 This was only possible with the help of many other LEGO fans these days, comfortable shopping facilities like www.bricklink.com didn't exist at that time. The preparations are coming to an end. The stickers are in place and the tickets are on my desk. February 2002: On February, 18th I lift-off from Frankfurt airport heading for Windhoek in Namibia. A fantastic trip just started this day … see some pictures from my trip at my Brickshelf gallery. The name "Express" is a little bit misleading. Both the model and the real train are moving rather slowly through the desert (or the tight LEGO train track curves).